I am not a financial planner, adviser, specialist, authority, expert, guru, or any other type of financial professional and this website is not a solicitation to buy, sell, or trade any type of investment product. Reading this website and commenting does not constitute an advisory-client relationship. Consider it kindly advice from an acquaintance or friend, it is presented as-is. The privacy of the community on ilovecompoundinterest.com is of utmost importance and as such your email address (or any other data) will not be sold or disclosed to outside parties, however we will gather email information as a part of site registration. Because the internet is changing rapidly, ilovecompoundinterest.com is not responsible for the accuracy or validity of content posted or any third-party links on this website, including some advertisements that appear within the site.. Rates and offers are subject to change at the discretion of third-party websites. If there is an offensive link or ad that you see on the site please notify me and I will do my best to address it. Any recommendations that are made on this site are made because I believe they could provide value to the readers. From time to time ilovecompoundinterest.com may get compensated for these recommendations. That compensation will contribute to the expenses of running the site. If you choose to access any website or company through this blog and purchase any goods or services, please do so at your own risk and through your own careful consideration of the benefits to you. Any views or opinions expressed by guest bloggers, commenters, or other persons besides myself are strictly their opinions and views and are not the views and opinions of ilovecompoundinterest.com. No content or photos used on ilovecompoundinterest.com can be used without permission. Please contact me at EMAIL if you are interested in utilizing content or photos from this site. Am I making money from this blog? Probably not much to start with, but maybe a little here and there. 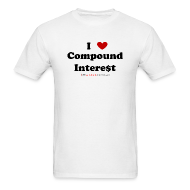 There will be a few types of “I love compound interest” merchandise available which I will get a small portion from if you choose to buy them. My focus for now is going to be to publish and post content and getting folks interested in the blog and participating in discussions and topics. I will have some ads that show and even some affiliate programs and the like to try and defray some of the costs to run and operate the blog. If it takes off and if there is real income to be generated, I’ll cross that bridge when I get there and update you as I go. If I could devote enough of my time and effort to make this successful, I would love nothing more than to make this my regular job.